We’re most certainly dealing with a hasty generalization when we say that this group or that group believes a certain way. The true case is that most likely a vocal group within a larger group believes a certain way and has or gets a public platform to address a subject. If there is a reason why our economic system fails, it’s due to utopian-drive millennials voting for socialist economic policies. What kills capitalism is the elimination of capitalism. In order to create wealth, there needs to be capital. The redistribution of wealth disincentivizes people from putting the time and effort into creating wealth. When millennials support Bernie Sanders who wants to make college education “free,” they are the ones destroying capitalism. The high price of college is mainly due to government involvement in helping to finance a college education. If there was less money available for a college education (taken from some people to be given to other people), colleges would have to lower their costs. If capitalism fails, then what are these millennials going to do when it comes time for them to retire? One could make the case that at their young age retirement is so far in the future that there’s no need to worry about it now. Maybe they could move to Venezuela where capitalism is dead. The goal would be to teach children the basics of economics early. If these early invested children started to add to their savings account each month as their own income grew, there would be ample money for retirement. It’s called deferred gratification. Putting off some present spending to reap the rewards of later benefits. Saving early might also help to inoculate them against Socialism. What economic system do these millennials think is going to “take care of them” in their retirement years? If not capitalism, then what? “All basic necessities are abundant and free”? 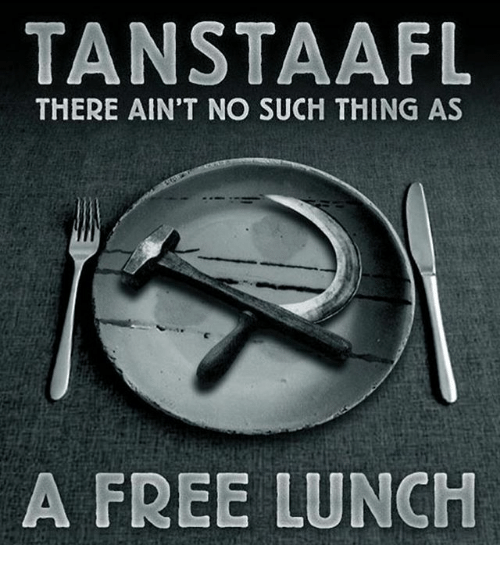 Nothing is free. It’s a basic rule economics. Someone is paying the bill. Governments don’t have money. People who are getting free stuff are benefitting from someone else’s labor. These millennials need a history lesson. The experience that we had in this common course and condition, tried sundry years . . . that by taking away property, and bringing the community into a commonwealth, would make them happy and flourishing – as if they were wiser than God. For this community (so far as it was) was found to breed much confusion and discontent, and retard much employment that would have been to their benefit and comfort. For young men that were most able and fit for labor and service did repine that they should spend their time and strength to work for other men’s wives and children without [being paid] that was thought injustice. If the views of these millennials catch on, we’ll all be dead. Next Why is our culture so Dazed, Confused, and Insane?